Babylonian amora of the fifth generation; died about 420. He was a pupil of Raba b. Joseph b. Ḥama, and his extreme youthfulness at that time is shown by the fact that his teacher designated him and Ḥama b. Bisa as "dardeḳi" (children; B. B. 16b). He frequently addressed questions to Raba (Mak. 8a; Men. 67a), whose sayings he cites (Shab. 136a, b). At an early age Rabina was recognized as a teacher, leaving the academy at Maḥoza while Raba was still living ('Er. 63a; Halevy, "Dorot ha-Rishonim," ii. 543-544). Wherever he lived he was recognized as a teacher and judge, and was called upon to render independent decisions ('Er. 40a; Giṭ. 73a). Rabina was on friendly terms with Naḥman b. Isaac (Giṭ. 32b; Hor. 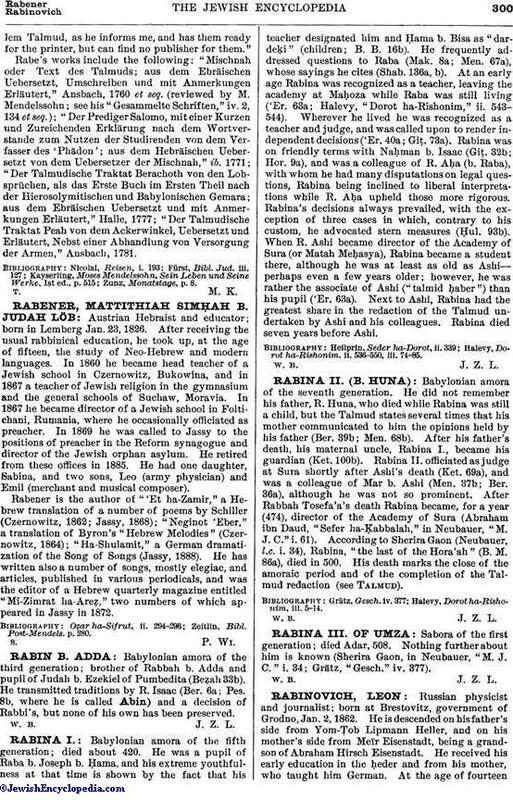 9a), and was a colleague of R. Aḥa (b. Raba), with whom he had many disputations on legal questions, Rabina being inclined to liberal interpretations while R. Aḥa upheld those more rigorous. Rabina's decisions always prevailed, with the exception of three cases in which, contrary to his custom, he advocated stern measures (Ḥul. 93b). When R. Ashi became director of the Academy of Sura (or Matah Meḥasya), Rabina became a student there, although he was at least as old as Ashi—perhaps even a few years older; however, he was rather the associate of Ashi ("talmid ḥaber") than his pupil ('Er. 63a). Next to Ashi, Rabina had the greatest share in the redaction of the Talmud undertaken by Ashi and his colleagues. Rabina died seven years before Ashi. Halevy, Dorot ha-Rishonim, ii. 536-550, iii. 74-85.